As a Los Angelino, I am rather accustomed to having the city’s historical edifices (yes, we do have them here) razed to the ground to make way for uninspired pillars of Plexiglas and spit. Priceless organizations here like the Los Angeles Conservancy fight every day of the year to protect what little architectual heritage we have from the buldozing jaws of professed progress that have so altered the makeup of the city over the past hundred years. And we cherish our precious victories, passionate to protect the last vestiges of our city’s living history. But Los Angeles is infamous for its proclivity of paving way for the new. Whereas, say, New York City? Well there’s a city with a living past that coexists with 21st century modernity in the same seamless manner of its European counterparts: London. Paris. Istanbul. Vienna. It’s a city with many a bragging right. Carnegie Hall, the Brooklyn Bridge, the Chryster Building, the Cloisters, Radio City, St. Paul’s Chapel, the Empire State that lady of liberty herself. And then there’s West 28th Street. Better known as Tin Pan Alley. 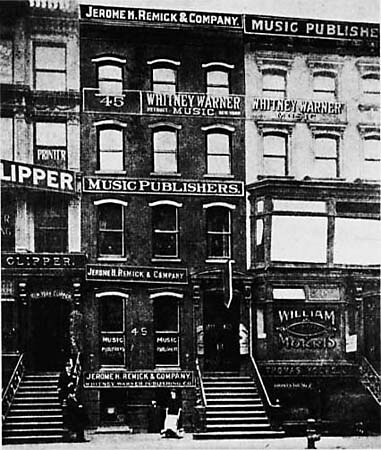 From 1893 on, it became the birthplace of modern popular music. A shabby stretch of road inhabited by the buildings in which the Gershwins, Porters and Berlins of the world penned the songs that would shape a century. But unlike its fellow points of historical interest, Tin Pan Alley, that bastion of myth and legend and lore, is facing annihilation. The owners of this block have put the buildings up for the sale for a cool $40 million in order to make for what will be, in all likelihood, an office block. 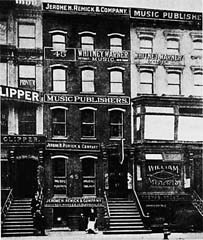 In order to prevent this travesty, Tin Pan Alley must be granted status as a permanent landmark by the City of New York. The Historic Districs Council in New York is on the case … but they need your support. That’s right, YOU. The one reading these words. Sign their petition online and help in the campaign to save this precious piece of 20th Century Americana. Take it from a Los Angelino: once these buildings die, a piece of all of us dies with them. History is a living, breathing, tangible thing. Help keep it that way! Read more about the campaign to save Tin Pan Alley.